This is our great recommendation to you if having 10days trip to Vietnam with a best view of culture, activities , sightseeing , and foods . The highest point of the package to cover the most highlight of Norhthern vietnam included : Halong bay – Ninh Binh and Sapa , not a busy and rush trip, this offers your slow speed visiting places and with colorful mixed activities of : Trekking, cycling, boat trip, kayaking, scooter ride . First stop to explore Hanoi colorful city included history , culture, foods , peoples and scenery as well ( a best taste to do it by scooter – back seat option ,if not can choose with normal way by car ) . Next to have great exercise of trek in Sa pa with gorgeous terraces rice fields , authentic villages , amazing valley , taste the real of Sa pa to stay in local homestay before back to the top world’s 7 wonders Halong bay to chill on great cruise with such as interesting activities of kayaking, swimming, cooking demonstration , visit local fishing village. The last stop for your great trip to Ninh Binh with best places to see and great activities together of boat trip , cycling and chill in great resort in this wonderful area . 8.00: Have breakfast and start to visit Hoa Lu - the first capital of Vietnam, see the temple where we workship our King. Listen to the story about Vietnamese history. 13.00: Get on the sampan boat to do the trip along the river. Enjoy peaceful and picturesque landscapes of Tam Coc river. And you will understand why it considered as Halong Bay on Land. 13.00: Go to visit the biggest pagoda system in Southeast of Asia. Visit the beautiful pagoda system with 500 La Han statues, biggest bronze Buddha statue in Vietnam with 10 meters in height, 100 tons in weight. Joe helped us to organize our 10 days trip in North Vietnam perfectly. He is friendly and accessible all the time. His instant answer and caring via what's app is incredible. The price is surly reasonable comparing to all those famous and big agencies. 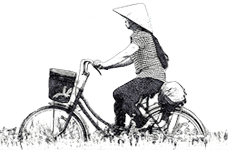 Highly recommended funny travel to all going to hanoi!